Following 2 victories on the epic Dakar Rally in 2016 and 2017, Peugeot Sport reveals the successor to the Peugeot 3008DKR that conquered South America back in January: the racing version of Peugeot's new SUV 3008 that was named as the 2017 'Car of the Year'. The new Peugeot 3008DKR Maxi is - as the name suggests - bigger: with a wider track designed to help it conquer the gravel roads, dunes and mountains of the most famous endurance rallies in the world. 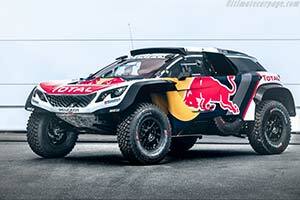 This latest evolution designed by Peugeot Sport's engineers is still undergoing development, but will make its debut on the 2017 Silk Way Rally that goes from Russia to China next month in the hands of nine-time world rally champion Sebastien Loeb, who finished second on the Dakar this year and is contesting the Silk Way Rally for the second time. He will be joined on the adventure, which runs from July 7-22, by team mates Stephane Peterhansel and last year's Silk Way Rally winner Cyril Despres: but they will be driving the current specification of Peugeot 3008DKR, as seen locking out the Dakar Rally podium earlier this season. Carlos Sainz, the fourth member of Peugeot's 'dream team' that will reunite to tackle the Dakar again next year, has also helped to develop Peugeot's newest off-road challenger, with the Spaniard's experience proving to be crucial. Loeb's role on the Silk Way Rally will be to assess the latest evolutions brought to the new car, in order to steer the development direction. However, as team director Bruno Famin points out, there can only be one overall objective on this arduous 15-day event: victory.